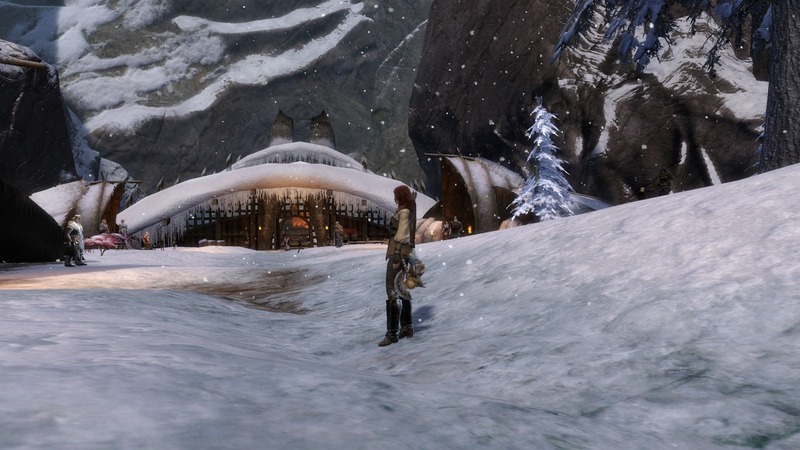 Nothing compares to the scale of lodges built in Hoelbrak. Walking up the stairs to the Great Lodge, it was difficult to capture the whole building in my line of sight. 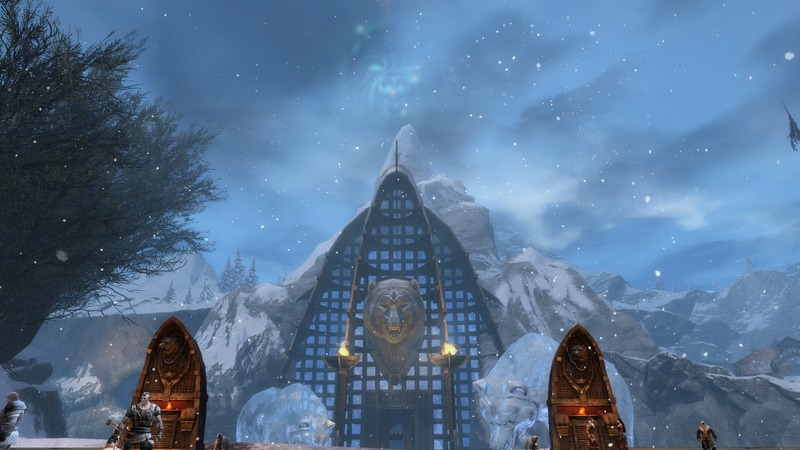 Fang of the Serpent, a tooth of Jormag’s hangs proudly inside the Great Lodge. Hoelbrak’s founder Asgeir Dragonrender chipped the tooth from Jormag. Adventurers that seek to kill the dragon test their weapons against the tooth, but no one has succeeded. At the tooth’s base, a friendly jotun named Thrulm the Lost answers questions about his race to strangers. He is the last storyteller and ancestor of the last giant-king. The gods (he didn’t say which) once favored the Jotun before humans arrived to Tyria and grew civilized. The Jotun’s power of magic and mechanical things were great, but during this Age of the Giants, the gods grew wary of their increasing power. They redistributed power to the other races. Falling out of their favor and losing their power, the giants killed each other, and their race descended into madness. Their society has slowly degraded over the past thousand years to the point where a once mighty, intelligent and sophisticated society has been reduced to slobbering idiots that fight with clubs and no longer remember their great history. The jotun are an ancient race. He mentioned that humans arrived in “boats across the great water”. I assumed he meant Cantha, but he didn’t pause his tale for questions. He spoke of their own encounters with the dragons. During the dragon’s last awakening “magic was wild”, and only after their sleep did the other ancient races rebuild their kingdoms. Other giants and norn were mentioned among the ancient races, which made me pause to think. Little is known about other giants. Besides jotun, there are ettins, yetis, and ogres. 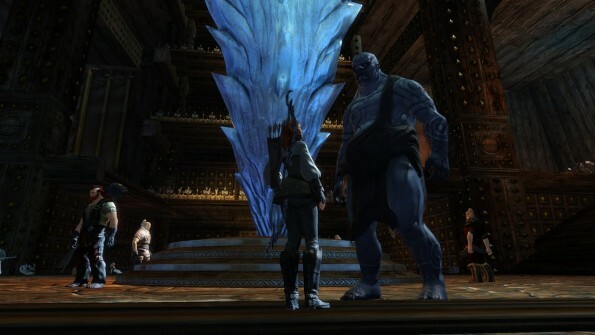 Given how long their race has lived, I wondered what other types of giants roamed Tyria (such as Giganticus Lupicus). It was difficult to believe everything he said. Much time has passed, and I can’t assume that the jotun’s oral history survived over a thousand years without some embellishment. With that admission, I’ll keep my eyes and ears open for more lore regarding the giants as I continue my journey. Aesa Wolfskin, my norn tour guide, greeted me in the Hunter’s Hearth section of the Great Lodge. Well known for their pride, they are also eager to show how great their race is to strangers. Aesa is a young adventurer like myself, and she revers Wolf spirit. Warriors and rangers are common professions among the norn, but Aesa chose the path of a guardian to carve her legend. 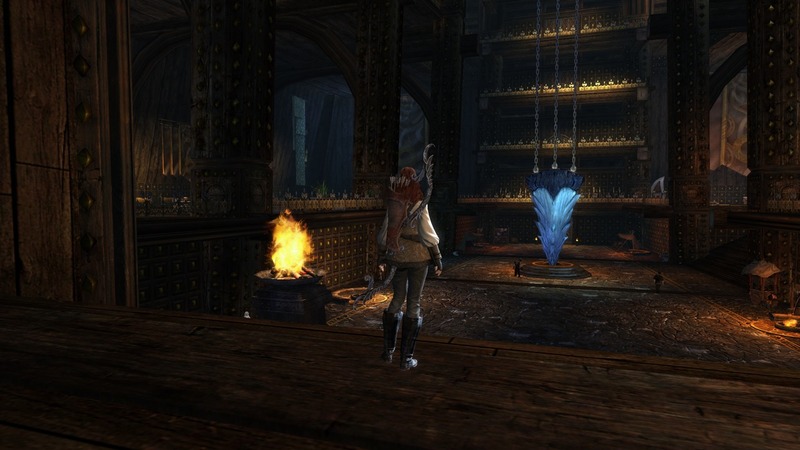 Hunters Hearth is home to many of the great adventurers that have risen in the recent years. It’s also a spot for the Order of Whispers to recruit. Agent Ifwyn wouldn’t divulge with any secrets or information, but she welcomed anyone seeking to join. On the western side of the hearth, paintings of a norn warrior and a lodge were proudly displayed. 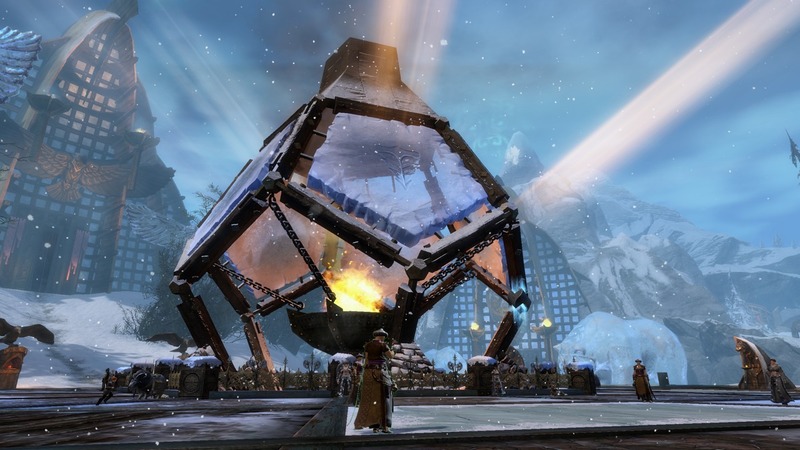 According to Aesa, norn are the best craftsmen of all Tyria, renowned for their armor and weaponsmithing. They are also said to produce the best ale. Ascending the stairs to the next level of the hearth, statues dedicated to the Spirits of the Wild are hung on a wall. Wolf, Snow Leopard, Bear and Raven are the four spirits with the greatest faith among the norn. 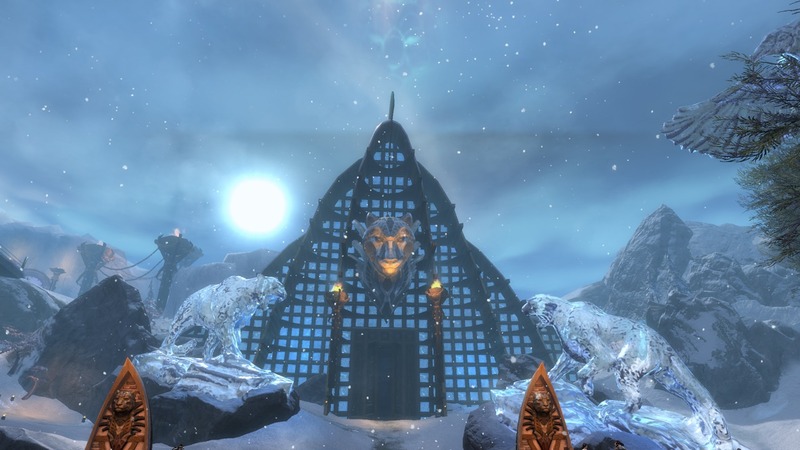 Lastly, we visited Knut Whitebear, the grandson of Asgeir Dragonrender. 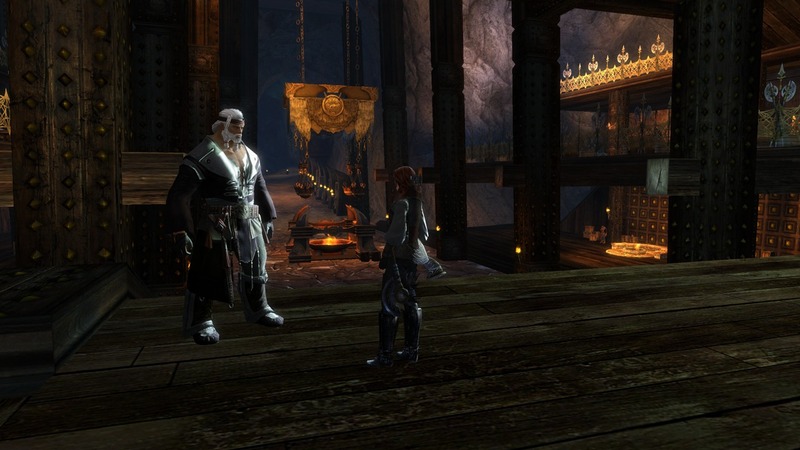 He’s the leader of the norn, but it’s not a position of absolute power. Norn value their independence and individuality. Leaders must earn their respect and achieve heroic deeds. Even Knut’s wife and kids are well known in the community for their heroics. Gaerta Whitebear has slain the Fleshreaver Lord, and his two sons Skarti and Sigfast run the Wolfborn, which guards Hoelbrak. It was an honor to meet such a hero. 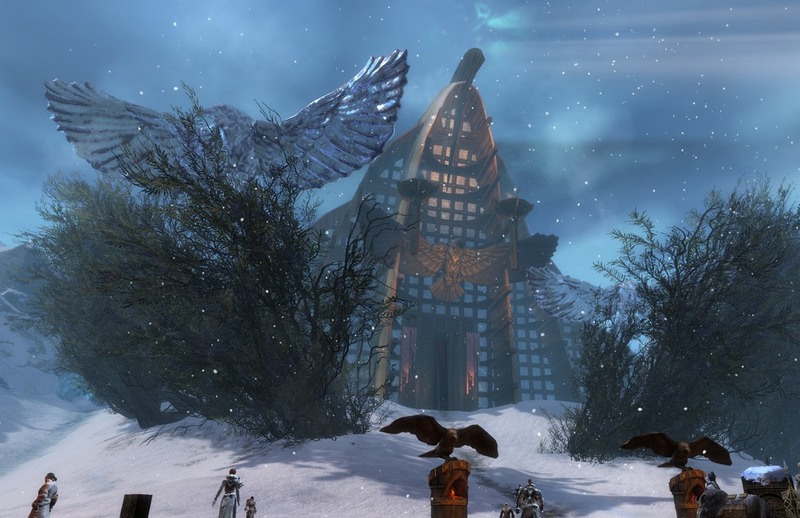 As I mentioned earlier, Hoelbrak and it’s surrounding areas were built over dwarven ruins. 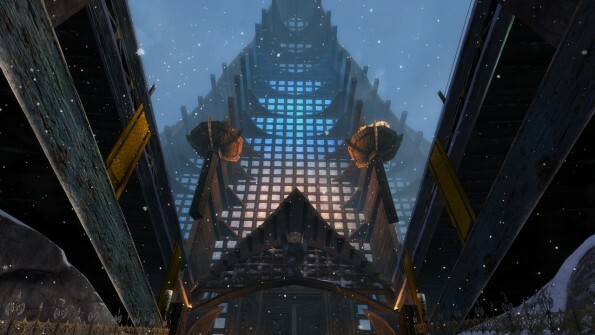 The Durmand Priory keeps a base in each city, but it’s no surprise that scholars have been drawn to Hoelbrak. Rynald Tarmino and his group are seeking audience with Knut Whitebear to gain permission to excavate Lake Mourn. Pottery fragments in the frozen lake may give them clues to Jormag’s weak spots. 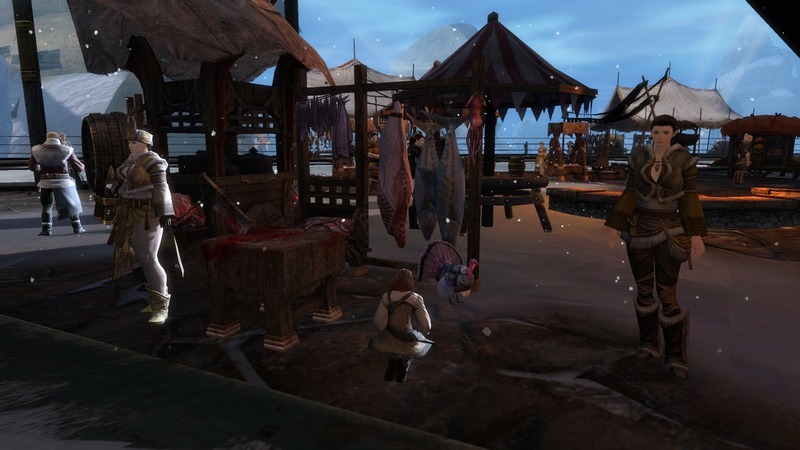 Walking across the Trade Commons, I spotted a turkey, a Krytan diplomat, and Kristyna Sohnstag, who was shouting warnings. She told me of terrifying “steam creatures” to the west in Lornar’s Pass. Dangerous monsters made out of metal and steam, they are currently a major threat In Lornar’s. I’ve never heard of such a strange creature, but I’ll keep my eyes open when I reach that area. 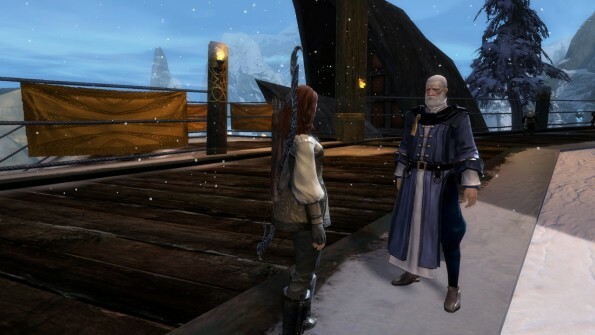 Perhaps even stranger than steam creatures, Samuel Cuttler is a Krytan that preaches about the six gods to norn. If the gods responded to prayers he may have something worth talking about. 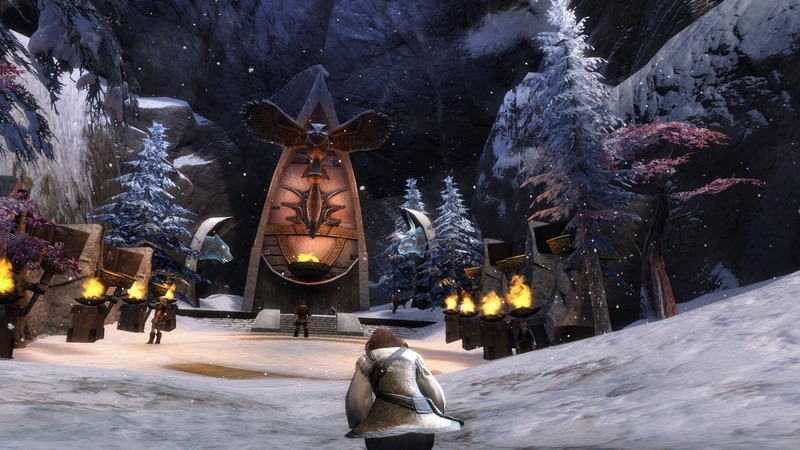 However the Spirits of the Wild do more for the norn than the six gods do for humans during this age. 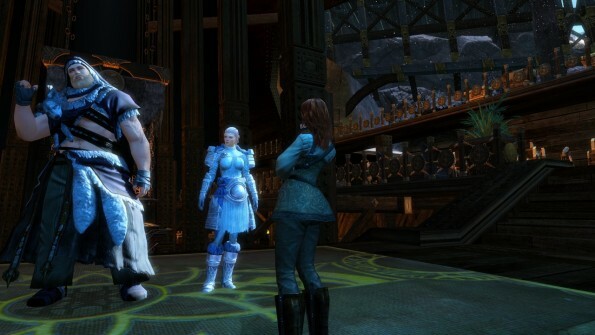 I found it disturbing how fervently he tried to convert the norn. Couldn’t he spend his time actually helping people instead of spouting his interpretations of what the six gods want? I’d like to see him pull this off in the Black Citadel! 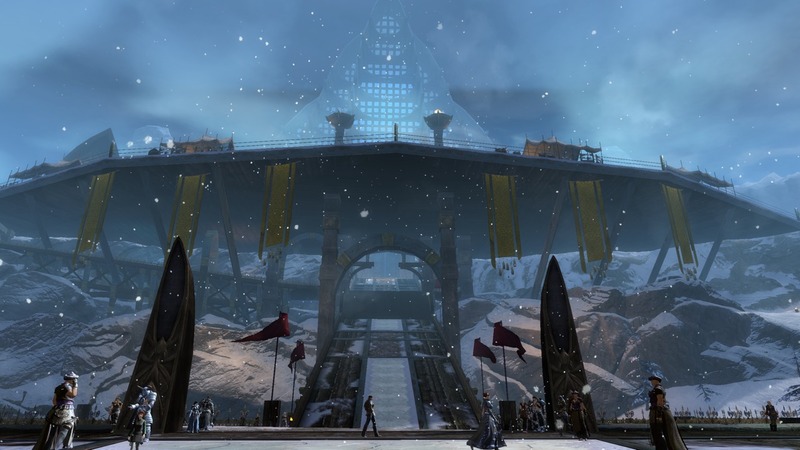 East of the Trade Commons, the Vigil make their message known loud and clear to the norn. With the well known threat of Jormag fresh in everyone’s minds, the Vigil are never short for recruits. 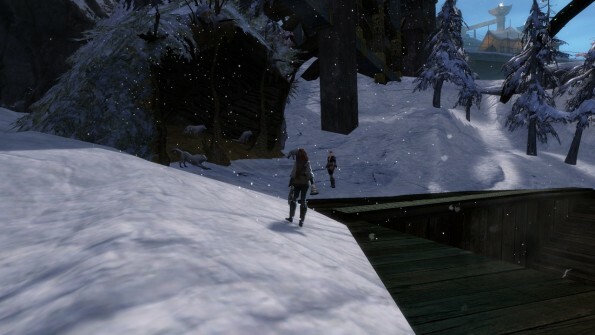 Continuing east, I entered the Frost Basin where Eir Stegalkin resides. I watched her deep in thought, working on a carving of Jora. 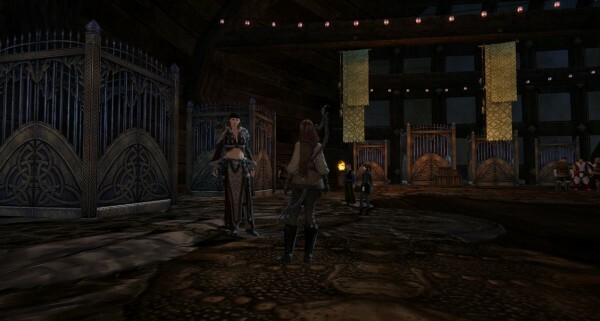 Not wanting to interrupt her, Aesa and I took a brief look over her workshop before moving on. A piece at the back of her workshop is devoted to Einar Cliffstrider, her father. He fell honorably at the Battle of Ice Crest and the inscription listed below read “Who dares, wins.”. 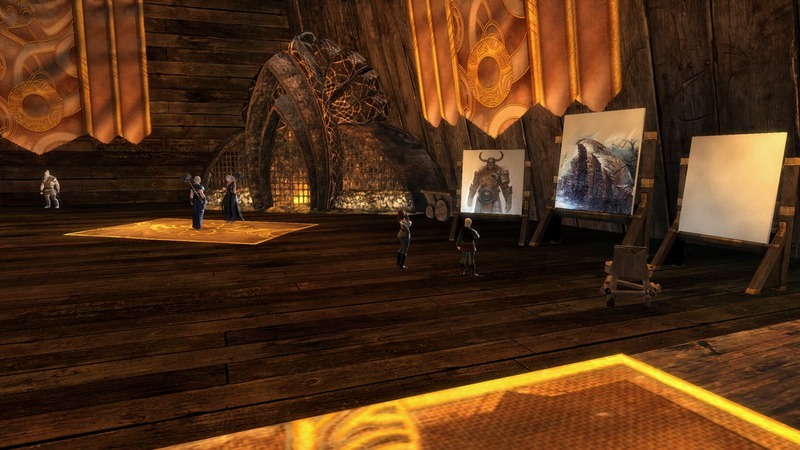 Several more impressive carvings are on display just outside Eir’s home. 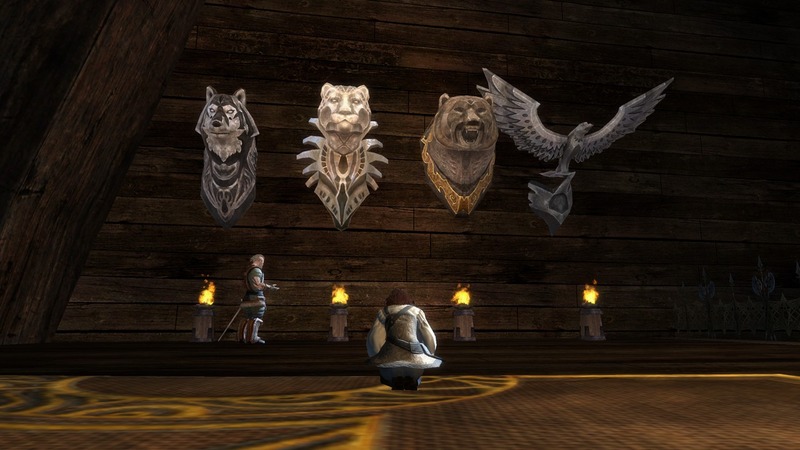 From left to right: Asegir Dragonrender, Gaerta Whitebear, Jora, Snaff, Brothhander Halfmad, and Setta Bladestrong. Two other notable buildings on the Frost Basin are the Boasting Hall and Old Fiach’s Lorestead. It’s clear that the norn cherish storytelling of heroic deeds, whether of themselves or of ancestors and friends. Old Fiach grew up listening to stories all his life, and he loves nothing more than passing on his knowledge. Of the tales he shared with me today, I heard more about Jormag, Jora and her corrupted brother Svanir, and the heroic sacrifice of Travan to save a caravan of humans from grawl. At the center of Hoelbrak, Aesa showed me the rays emitted from the fire below, lighting through sheets of ice. The pictorial on the ice sheets are projected onto the sky over the lodges of Hoelbrak. 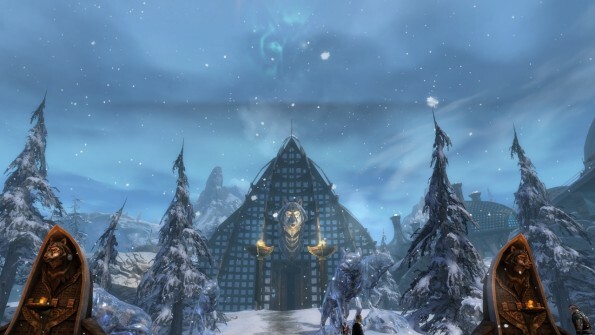 From the asura gate it was difficult to see the one over the Great Lodge, but at the center it was easy to see all of them. Next on the tour, we headed towards the Wolf Lodge. Each lodge devoted to the Spirits of the Wild have leaders that devoted themselves to that spirit. These speakers pass on information about their Spirit and give guidance to those seeking answers. Fastulf Jotharrson is the speaker of Wolf. He heard the Spirit’s howl when he reached manhood and has spent the rest of his life learning about Wolf. The Wolf Spirit symbolizes brotherhood and loyalty. Aesa was brimming with pride as we listened to Fastulf talk. I can’t truly know what it means to worship the Spirits or have a connection with them. But it’s fascinating to hear from their devoted followers about the Spirits and their deep connection with the norn. 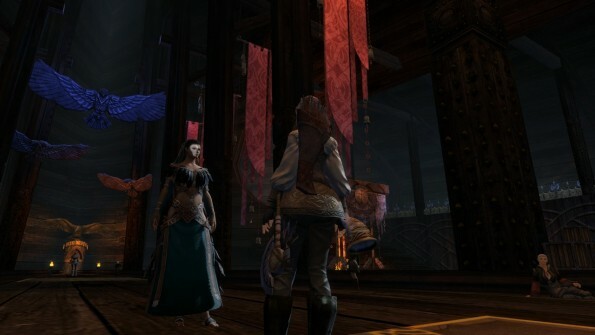 Somewhat like the six gods, the Spirits of the Wild do little to impact Tyria. However, the Spirits still answers prayers. I also learned about a special devotee of the spirits called havrouns. These priests can literally send their souls into the Mists, reaching the Hall of the Spirits. Only one havroun per Spirit of the Wild exists at any given time. A den made especially for wolves is located on the second level of the lodge, facing the outdoors. Alpine wolves and their pups live here peacefully among the norn and their own children in the lodge. Spirits of the Wild helped guide norn south to escape Jormag, but it was only possible due to their sacrifices. Owl was eaten by the dragon, while Ox, Eagle, and Wolverine gave the norn time to escape by distracting the dragon. Only Owl’s death is confirmed, the other Spirits may still live but no one has heard from them since. I knelt and paid my respects to them at the Lost Spirits’ Hallow shrine. 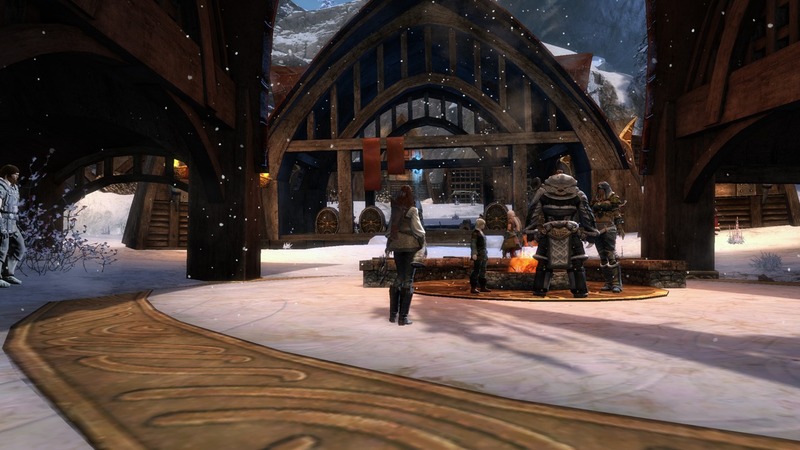 Passing Vheratha’s Tavern and the Hall of Legends we arrived at the Bear Lodge. 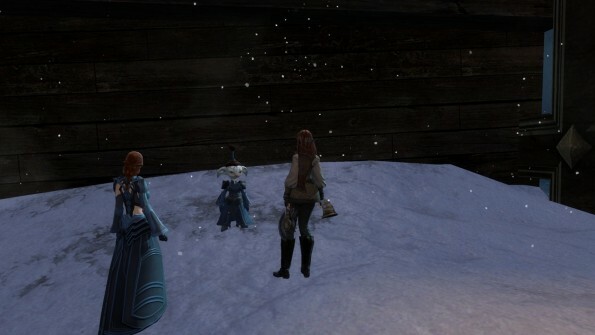 Alarrin of the Frost, Bear’s Speaker told us of his foolish youth. He was a tireless warrior, but could no longer fight after he sustained a leg injury. When he sought Bear for guidance, Bear gave him the means to go on. Alarrin has since then devoted his life to Bear. Bear is the most revered of all Spirits, and she symbolizes strength in body and mind, ferocity and confidence. Besides the speakers of the Spirits and the havrouns, the norn generally seek wisdom from all the Spirits. Anyone can hear their voices and gain their insight for their problems. A cave at the far end of Bear Lodge expands into an area known as Shelter Rock. The Wolfborn’s base is located here, along with other shelters where norn meet, drink, and converse. Shelter Rock also contains a graveyard for outsiders. It’s keeper Ingun Grimsdottir explained that they place stone cairns over the bodies to honor wishes to be buried. 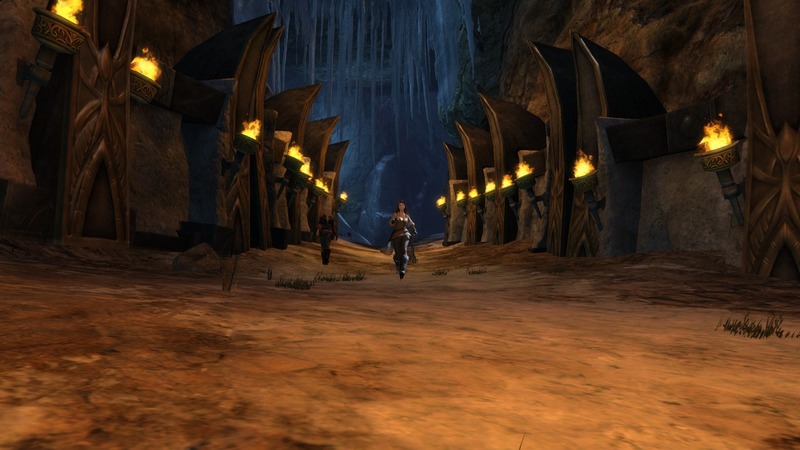 Norn prefer their bodies to be set alight on a pyre, but a few choose to be buried here as well. Looking at the various headstones and inscriptions, three graves stood out. One belonged to a wolf named Alistair. 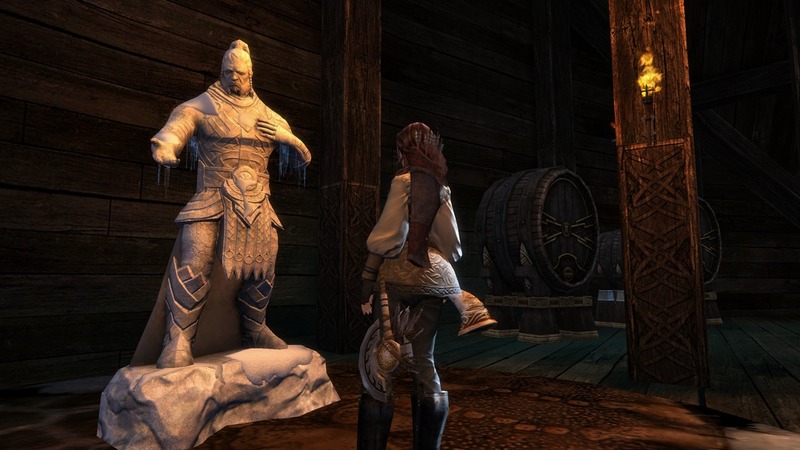 The other was in remembrance to Gyda Oddsdottir, a norn warrior who died helping Dougal Keene retrive the Golem Eye in the Divinity’s Reach crypts. 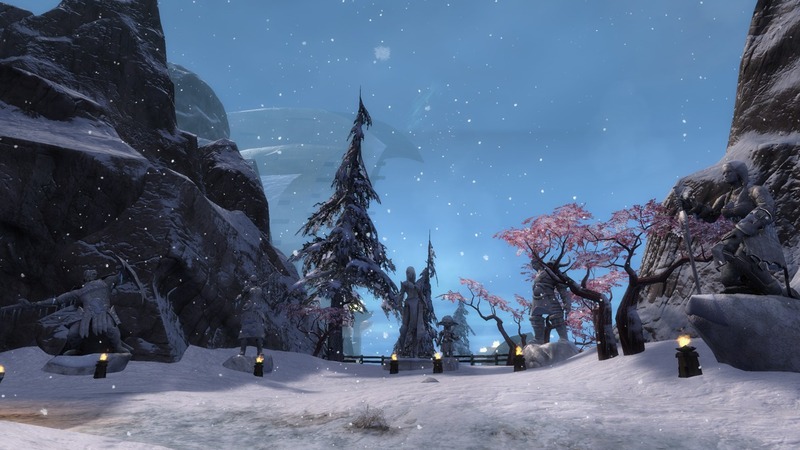 Thirdly, a cairn which honors a sylvari named Faernach. The sylvari race has not existed for long, so this grave must have been filled in recent memory. Moving out of the darkness of Shelter Rock, we headed to the Raven Lodge. Just outside it’s gates, an asura named Finn was having an argument with a fellow Priory scholar. He discovered an old fireside song that foretold of Knut Whitebear’s death. “…and the muttering voices will call for his blood“. Intriguing, but it could turn out to not actually mean anything. Moda the Quick’s path to become a speaker started back when she was a young hunter. Alone and lost in a strange place, a snowstorm trapped her. The Spirit of Raven flew overhead and guided her back home. Owing her life to Raven, she dedicated herself to the Spirit and spreading it’s lessons. Raven symbolizes wisdom, cleverness, clarity, and perspective. Below in by the warmth of Raven Hallow, I overheard a conversation between a human named Alaric Torgan and one of the elders. 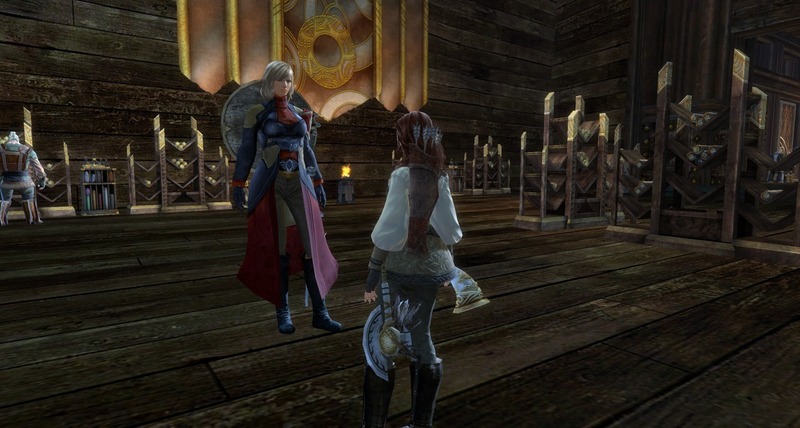 Alaric mentioned an old hag named the “Iron Witch”, and they talked about King Jalis Ironhammer’s treasure. I then spoke with Alaric. 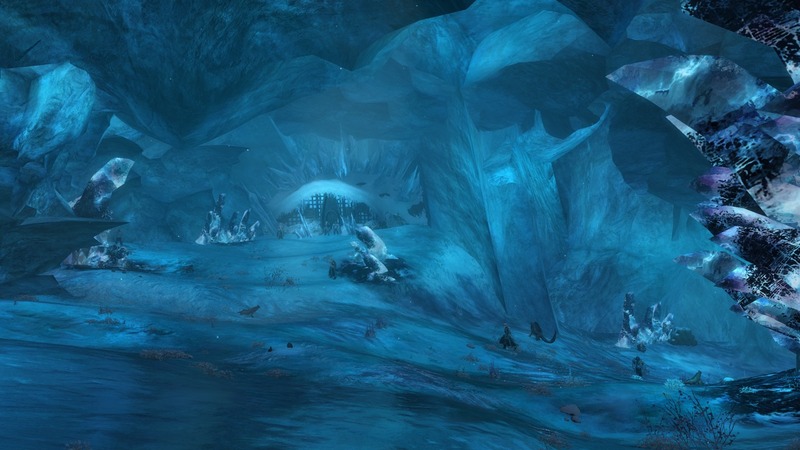 According to a scroll his colleague found, wealth and gems were buried at Krok’s Hollow. It’s also the site where the dwarf king met with Prince Rurik. The ruins are far away; probably on the south edge of Frostgorge Sound. It will take me quite some time to reach there (as I have other places to explore first), but I’ll certainly poke around Krok’s Ruins for any gems or clues. Next, we visited the last building devoted to the Spirits of the Wild: Snow Leopard Lodge. Valharantha’s connection to Snow Leopard was deep even in her early youth. Everyone recognized her passion and the role of speaker was granted to her upon reaching adulthood. Snow Leopard symbolizes stealth, prowess on the hunt, and independence. 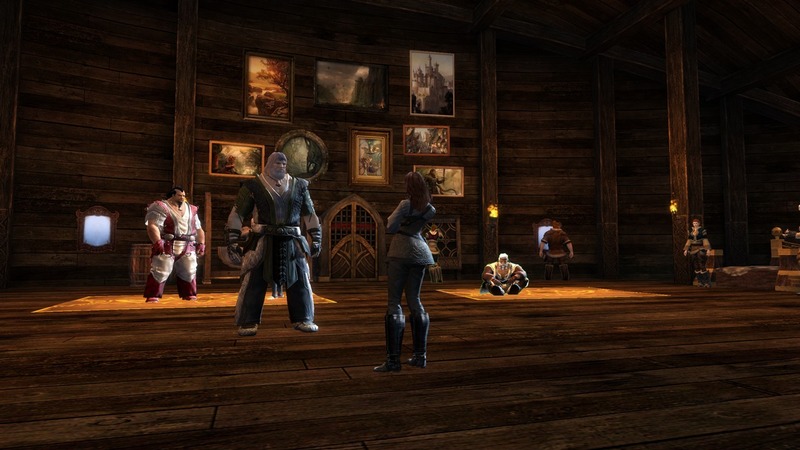 Upstairs in the Raven Lodge, Keil Hallinger runs an interesting menagerie. There is a white moa, hawkeye griffon, and a jungle raptor. 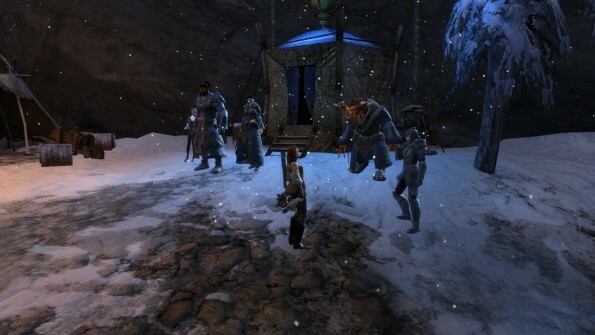 Keil used to keep more animals, but the raptor she ordered from an asura ate the other animals. Terrible as it sounds, Keil should have expected as much from such a ferocious animal. 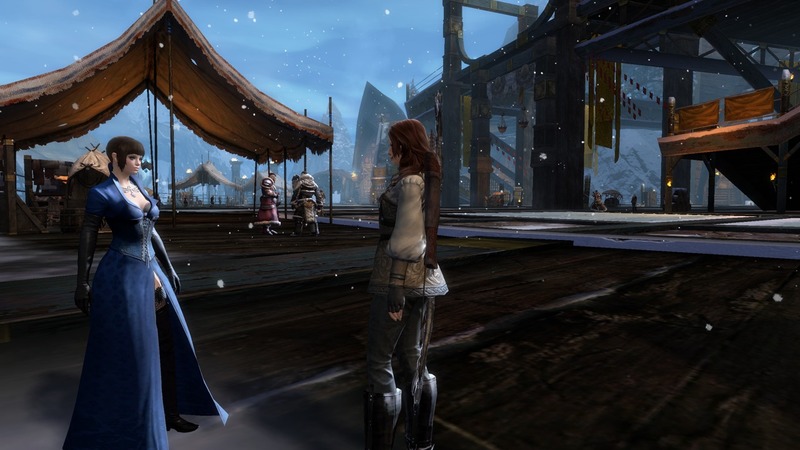 The frozen waters of Lake Mourn provide a great location for norn to have a bit of fun. There’s a brewery to the north, and a local game taking place on the ice called “Keg Brawl”. Two teams fight to gain possession of a keg, and to bring it to a goal on their side of the lake. Points are awarded for succeeding, but also intercepting the keg. A statue of Jora overlooks the lake. 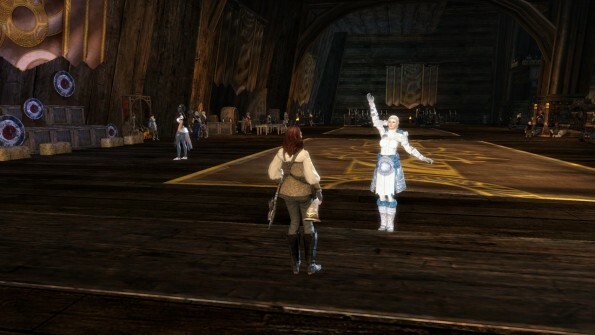 She’s a legend among the norn, and lived during my heroic ancestor’s time. 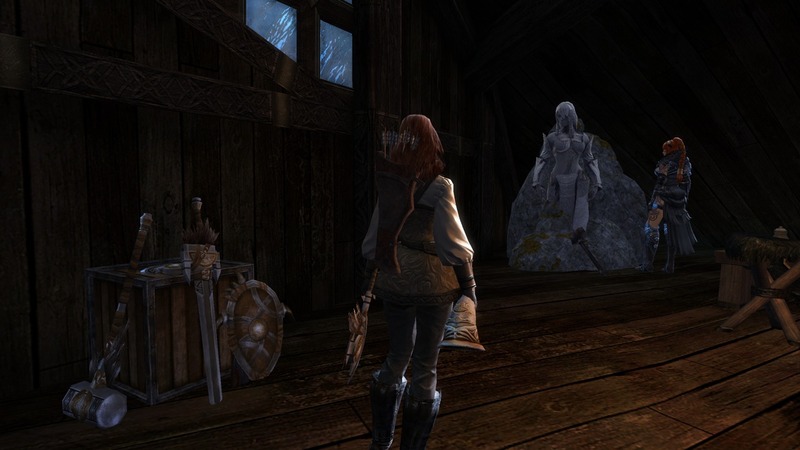 Due to strange circumstances, her brother Svanir was corrupted by Jormag. 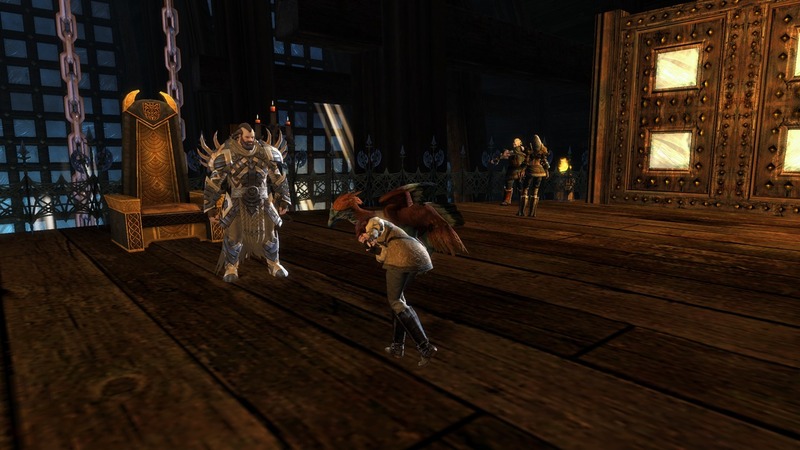 Jora shunned the dragon’s power, but it cursed her so she could no longer transform into a bear. Svanir was forever transformed into the “Nornbear”. 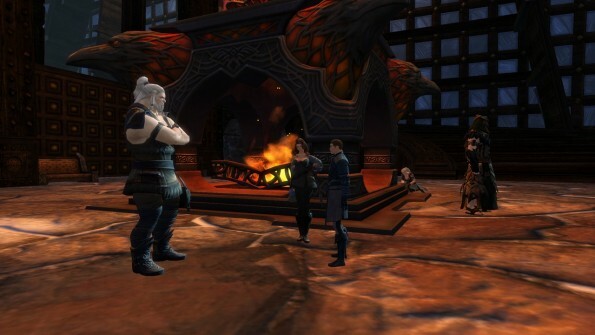 He tormented the norn until the day Jora (along with my ancestors and other heroes) tracked Svanir down and killed him. On the subject of Svanir and the dragon Jormag. To the north of Lake Mourn is a cave system overrun with the Sons of Svanir; followers of Jormag. Ever since Svanir’s dark transformation 250 years ago, foolish norn have chose to revere Jormag. Seen as the greatest force of nature, they shun the other norn and their Spirits of the Wild. 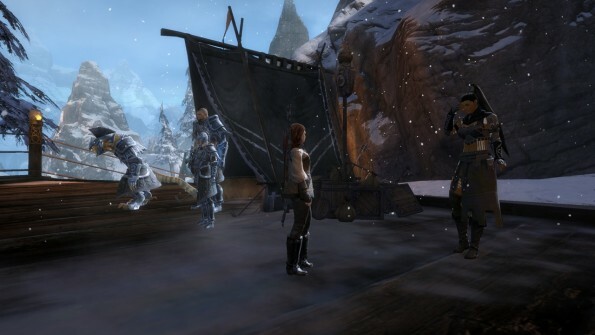 Only male norn are accepted, and all women and different races are seen as enemies of Jormag. 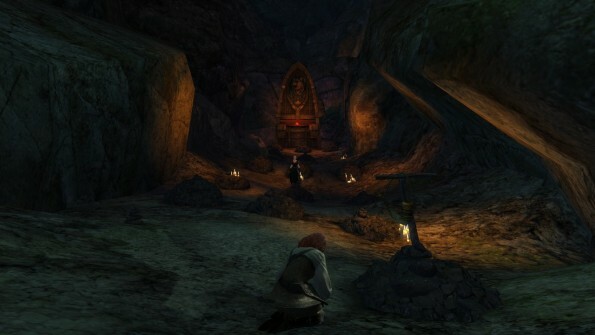 It was difficult to understand why the norn would allow the Sons of Svanir to live in Hoelbrak (even in a cave). 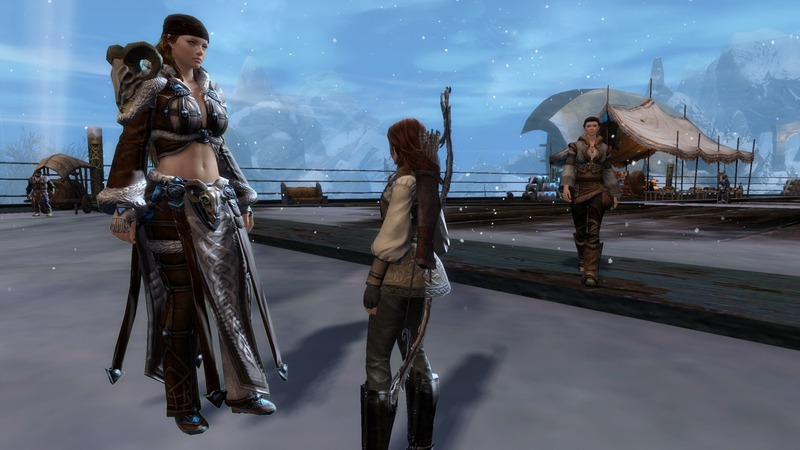 Aesa explained that norn judge each other based on their actions. Those that live here are not seen as a threat, and with guidance they hope the Sons of Svanir will see the error of their ways.